Nellie Marks Nakamarra has been surrounded by some of the great names in Aboriginal art. 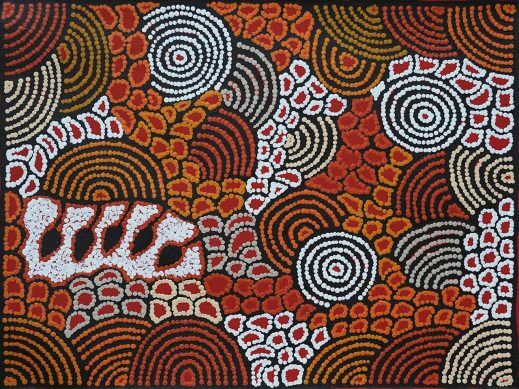 Her stepfather Turkey Tolson Tjupurrula, and other significant Aboriginal artists from that era including Old Mick Namarari Tjapaltjarri and Uta Uta Tjangala. Nellie’s older sister, fellow artist Elizabeth Marks Nakamarra, has established her name amongst Central Desert artists, and Nellie has needed the time and space for her artistic talents to develop and grow. Now Nellie Marks Nakamarra is making artistic statements of great strength and character, using the traditional knowledge that she has received and the stories associated with her Father’s country. Her images of both the country and the Tingari ceremonial components attached to that country are impressive, and her paintings are developing a spaciousness that distinguishes her work amongst the traditional paintings from her country.